When I was a teenager (many, many moons ago), one of the hot spots to hang out was the Pitt Street Bridge or the 'Old Bridge'. There would be a line of cars and trucks parked on both sides of the bridge. It was 'teen tailgating' - we'd hang out, listen to music and hop from group to group until the neighbors complained and we'd have to take the party elsewhere. 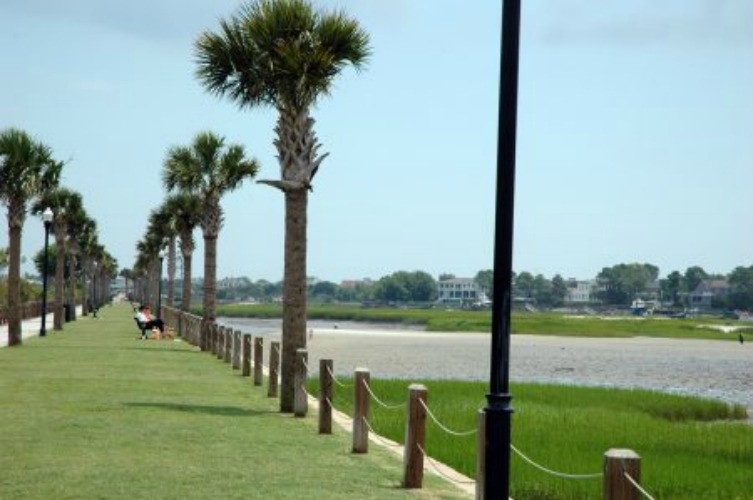 The Pitt Street Bridge was originally a bridge made of planks stacked on barrels. In the late 1800's, it was converted to a trolley bridge. Folks would ride the ferry from Cumberland Street downtown to Mount Pleasant, and would then take the trolley across the bridge to Sullivans Island and Isle of Palms, the 'Atlantic City' of the South. Through the years, it's been my hot spot for many family activities: jogging, fishing, crabbing, kayaking, fireworks watching, biking, etc. My now teenage sons have both boasted jumping off the Bridge with other youth in the neighborhood in a rite of passage that has been practiced for many generations. These days, it's my daily dog-walking, bird-watching hotspot. I greet the same folks every morning and we look for a pair of wood storks while our dogs drink from their special dog water fountain. The wood storks are quite a celebrity because they are not indigenous to the Lowcountry. Say what you want, but I think they plopped down in the pluff mud, took in the spectacular 360-degree views of the Charleston Harbor, ICW, and Sullivans Island, fell in love, and couldn't imagine living anywhere else. Sounds like a lot of folks I work with, doesn't it?